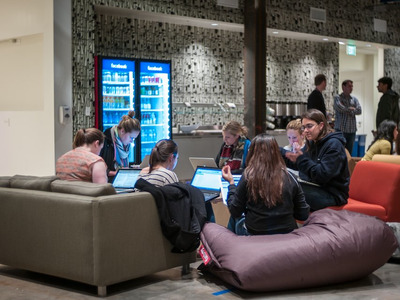 FacebookNew Facebook engineers get right to work. The first day at a new job is usually pretty easy. You can expect to fill out some paperwork, grab lunch with new coworkers, and perhaps do some light training — but usually not much more than that. But that’s not the case for new employees at Facebook. Engineers starting at the social networking giant are tasked with writing new code for the site on their very first day, according to a 2013 VentureBeat story. The exercise is part of Bootcamp, a six-week onboarding program for new engineers. The program was created in 2008 by early employee Andrew Bosworth, now the company’s VP of advertising, in order to maintain Facebook’s culture as the company expanded. This last bit is the reason every new engineer is given a software bug to fix on Day 1. Within days, the new engineers are expected to have code ready to go live for Facebook’s 864 million daily users, according to a story in the San Jose Mercury News. The idea is to get new engineers used to the frenetic pace with which the company is always updating its site and to push them to solve problems under pressure. As you might imagine, this process hasn’t always gone smoothly. The Mercury News reports that Bootcampers have on several occasions crashed parts of the site in their attempts to fix something. But instead of being seen as a sign that the engineer isn’t Facebook material, the company uses the experience as an example of how it is ok to fail sometimes so long as you are trying new things. By the end of their six-week Bootcamp, the new employees are expected to have a sense of which things they like working on best, and are given a choice over which engineering team they will join.